Welcome to Wethersfield Historical Society’s homepage of events! Wethersfield Historical Society (WHS) is a 501(c)3 non-profit, membership-supported organization. Founded in 1932, the Society has strived to “preserve and promote Wethersfield’s history and culture to inspire people today and tomorrow” through the present day. Below is a selection of our upcoming events, an exciting way to connect with local history! 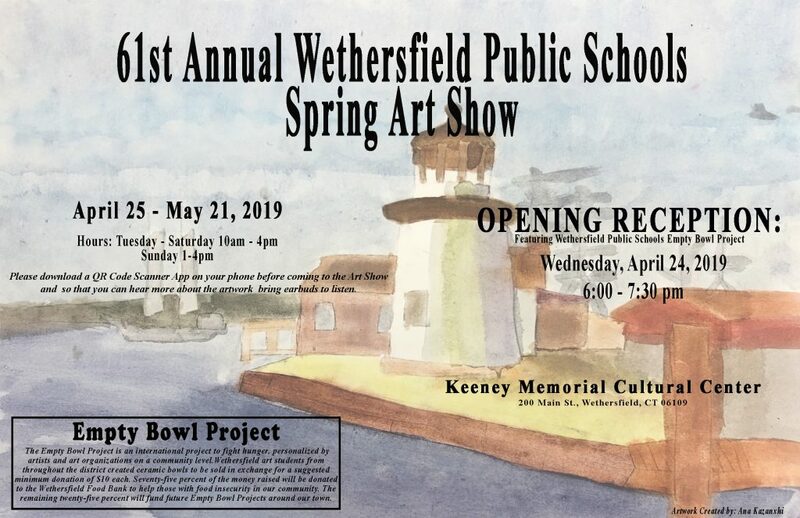 Beginning on Wednesday evening, April 24, with an opening reception from 6:00 to 7:30 pm, the Wethersfield Public Schools Spring Art Show will remain on display from April 25 through May 21, 2019 in the Keeney Memorial Cultural Center (200 Main Street, Wethersfield, CT) Tuesday – Saturday 10:00 am to 4:00 pm and on Sundays from 1:00 pm to 4:00 pm. The Opening Reception will feature works from the Open Bowl Project, an international project to fight hunger on the local level. Wethersfield art students have created ceramic bowls to be sold for a suggested minimum price of $10. 75% of the proceeds will go the Wethersfield Food Bank and the remaining 25% will be put toward future Empty Bowl Projects around Wethersfield. Taste of Wethersfield XIV Patron Drawing Winners!